CAT magazine is one of the most renowned and well-read magazines within the automotive Aftermarket, with a circulation of over 15,000 highly relevant contacts, from independent garages to motor factors to suppliers. Approximately every other month, we at Automotive Brands place an impactful half-page advert to benefit one or several of our brands. This month, CAT readers will notice that two of our brands are taking the spotlight; Power Maxed’s Coolant Seal, and Steel Seal. Steel Seal, the core product with which we made our name, is a head gasket fix. 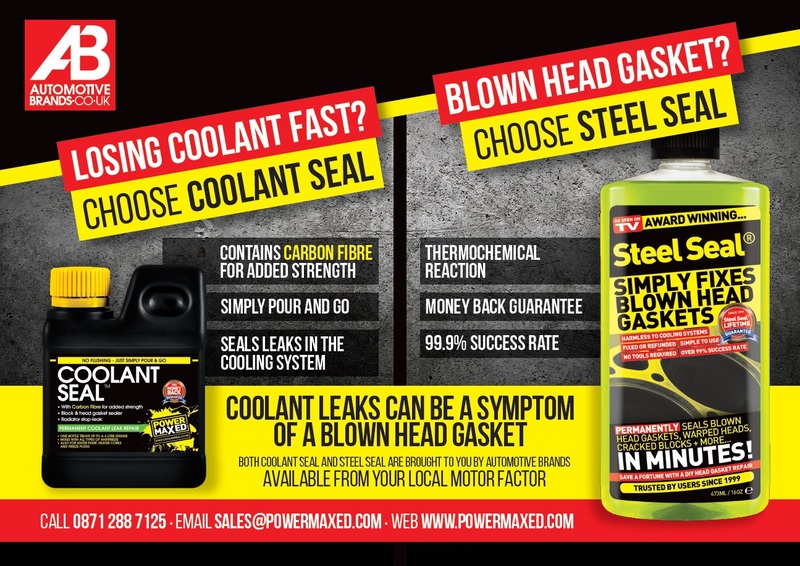 Unfortunately, some symptoms of a blown head gasket, such as coolant leaks, are not always signs of a blown head gasket, and customers experiencing these symptoms unattributable to a blown head gasket will have no success in stopping the symptoms alone with Steel Seal. The purpose of the advert is to clarify to the readers of CAT when to use Coolant Seal, a coolant stop-leak product, and when to use Steel Seal. This will not only help the understanding of potential garage customers, but will help our stockists to understand what to recommend for certain issues too. The advert also accrues brand awareness for both Power Maxed and Steel Seal, helping our stockists to sell our products to the ever-more-knowledgeable end-user. Should our stockists have any recommendations for the improvement of our magazine advertising, please contact marketing@automotivebrands.co.uk.